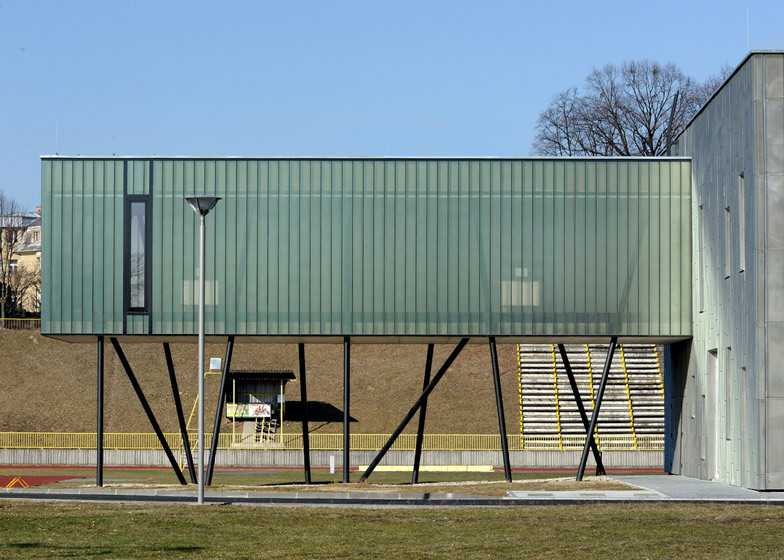 To create a full-length running track inside this refurbished gym in the Czech Republic, Prague studio QARTA Architektura added a translucent extension that projects out on stilts (+ slideshow). Tyršův Stadion was first constructed in the 1960s as part of an athletics arena in Opava, but the building had fallen into disrepair and QARTA Architektura was asked to upgrade the facilities. The gym covers the whole first floor, but isn't large enough for all the athletes that want to use it. 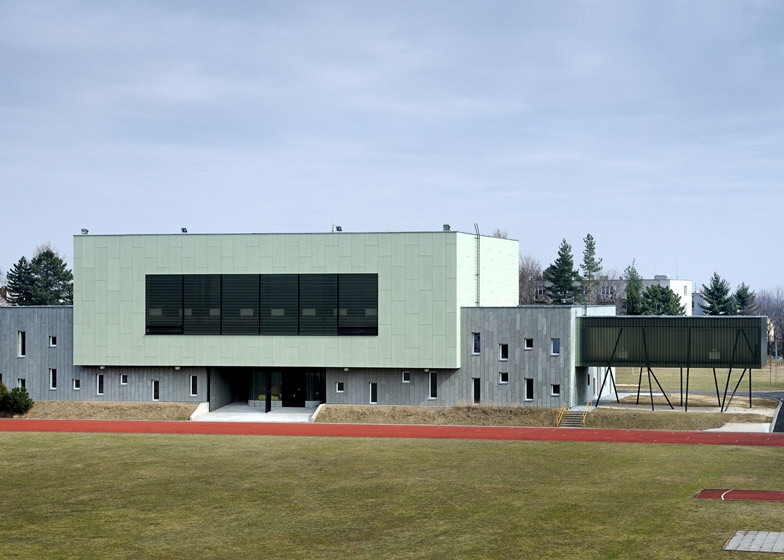 "Before the gym was too short to do inside sprints, long jumping and pole vaulting," architect Tomáš Němec told Dezeen. "Because of this we extended the running track out of the building." 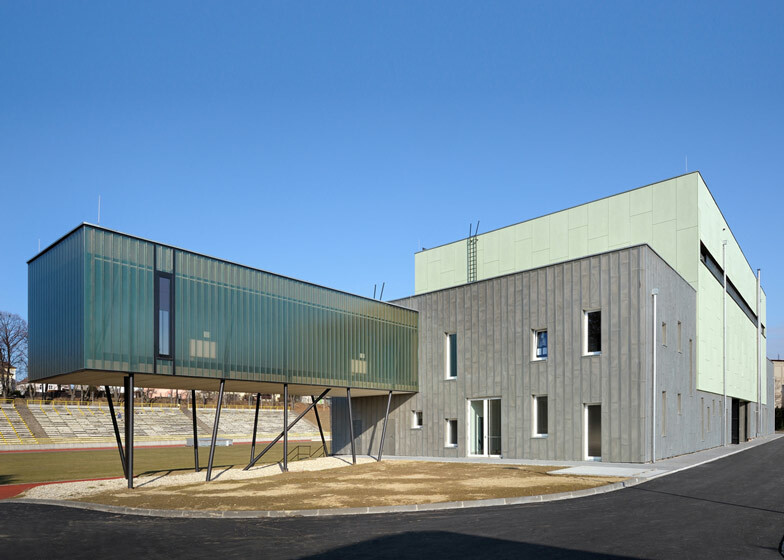 The architects used polycarbonate for the translucent extension, but covered the existing facade with metal sheets and fibre cement panels. "The foundations were badly constructed, so these materials were chosen to resist the slight moving and cracking of the building," said Němec. Entrances are located on both sides of the building so that it can be used as a gateway to the outdoor track. 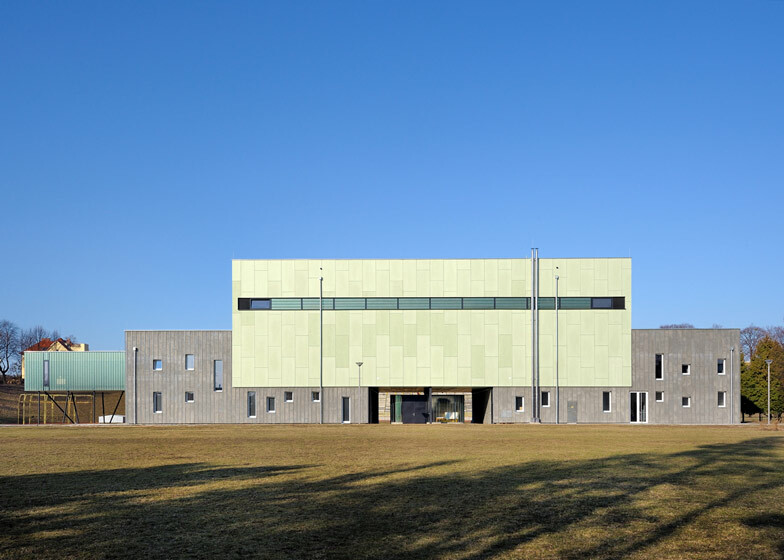 Other sports buildings we've featured recently include an indoor football ground in Portugal and a sports centre with a rooftop tennis court in Poland. 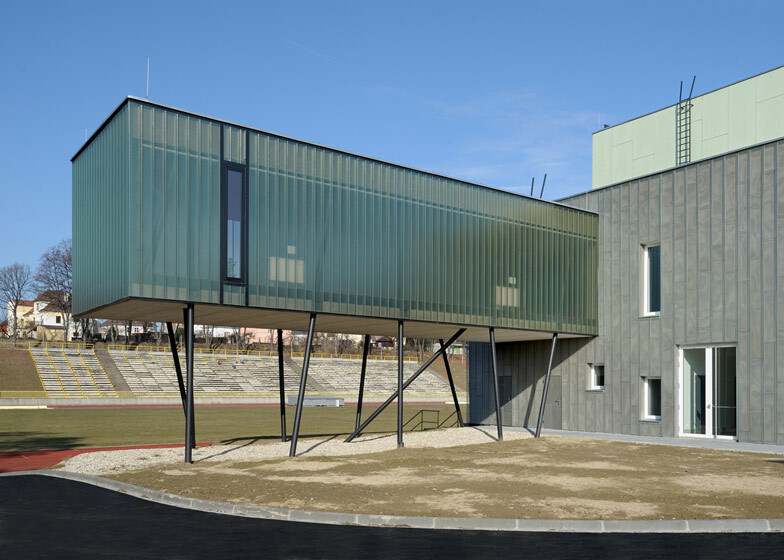 Qarta architektura designed a multi-purpose athletic gym within the complex Tyršův stadion in Opava. 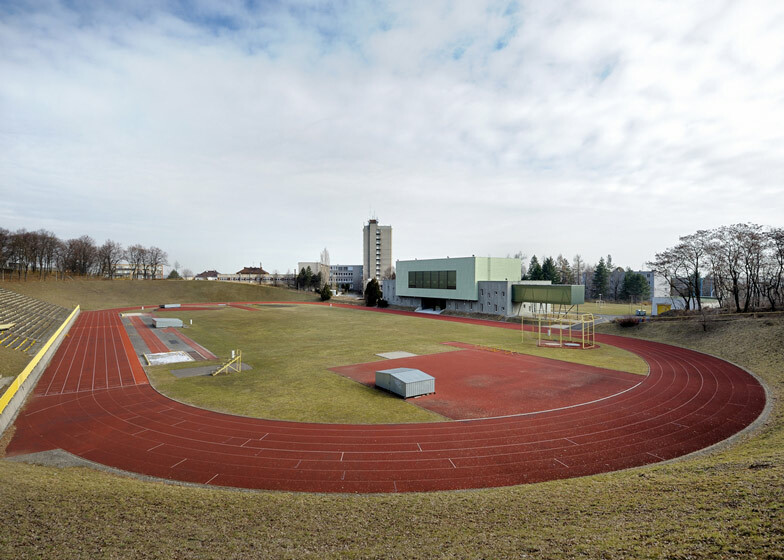 The old gym as a part of the athletic stadium in Opava, now Tyršův stadion from the time of normalisation socialism, built early in the 60s, was ready for demolition. Investor, the city of Opava, in the framework of the promotion of sport and culture, came to entering the regeneration of the gym. The work took Qarta architektura, whose undeniable advantage in the implementation was the fact that the studio knows the area very well. The building is designed to be a natural gateway for the athletes when they enter the stadium. At the entrance to the gym, athletes are guided intuitively into locker rooms with complete facilities and then they can choose between a workout at the gym, or so-called "gate of champions" to enter the stadium. The whole building is formed from three blocks. One of them is a part of the indoor running track, which seems levitating in the air. The gym includes facilities such as indoor running track 60m, the long jump pits, height for the pole vault, universal surface that enables ball games. But mainly is a gym designed for athletes, the surface is in such standard to allow running and walking in track shoes. Another equipments are facilities for archery, fitness and room for judo with the tatami surface.